Wipe Out Crew Celebrates Passing of Bill 2571! KAISER WINS! It's Academic Hawaiʻi Threepeat! Congratulations Cougars Jacob Heberle, Ryan Chafee and Lucy Chalekian for bringing home Kaiser's 3rd, Itʻs Academic Hawaiʻi Championship! It was close, but not close enough for these lightning fast Cougars. If you missed it, tune into KFVE on Saturday, July 14 at 9:35pm, for a replay. Hoʻomaikaʻi Cougars! Congratulations to Bradley Wood for being awarded one of 16 HMSA Kaimana Scholarships awards. The Academic Awards night was full of good cheer and deserved accomplishment. It was also bittersweet as it was Mr. Hutcherson's last time taking the stage to emcee the event after 20 years. Please click on the link to see this year's awardees. Congratulations to all. Over the Spring break, Band Director, Mr. Bataluna and our Cougar Band traveled to Japan to play with our sister school in Japan - Nagaoka High School. Have you checked out our The Cougar Times, the official newspaper of Kaiser High School, lately? Editor Jolie Ching and her news writing staff have been hard at work to revamp the newspaper and website. Questions on Scholarships? College Visits? Testing? Our website is beginning to take shape as the College & Career section has uploaded a wealth of information to help make your high school-to-college transition a lot easier. Check them out! Kaiser High School DECA Club wins 1st Place! 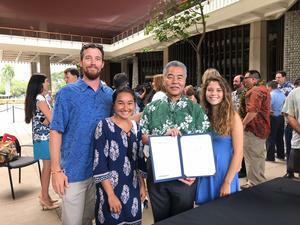 American Savings Bank awarded Kaiser High School with a $25,000 grant through the Hawaiian Electric Industries (HEI) Charitable Foundation for placing 1st in the 2017 KeikiCo Business Plan Competition.